In 1967, Canada celebrated its 100th anniversary. To commemorate this event, a special display team of CT-114 Tutor aircraft with solo CF-101 and CF-104 display planes toured the country. 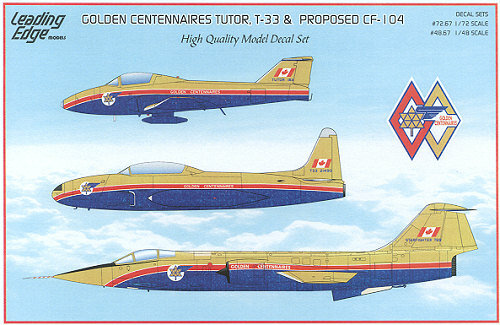 The fighters were not specially painted, though the proposed scheme for the CF-104 is included in this sheet. 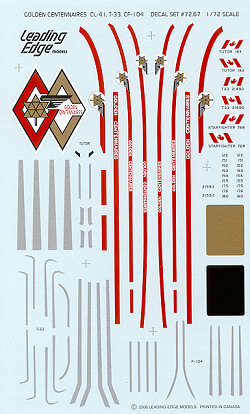 So are markings for the support CT-133 Shooting Stars. The sheet includes all the stripes and serial numbers needed. For the blue, Humbrol #15 is the match and for the Gold, Floquil 'Bright Gold' is the recommended paint. A superbly done placement guide is included and while a mask would have been nice, it isn't really needed as you can use one of the side fuselage stripes to make one. There is a cautionary note on handling these decals as the gold paint causes them to be more brittle than normal. There are decent kits of all these aircraft available with Hobbycraft having a Tutor; Hasegawa and Heller a T-33; Italeri/ESCI and Hasegawa have CF-104s.